Every day millions of drivers are on the road during a time when the sun is either rising or setting. 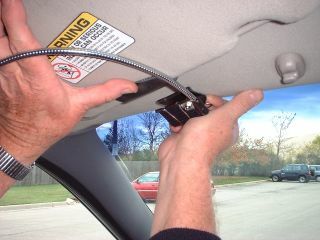 Often a vehicle driver or passenger finds that his vehicle sun visor is inadequate for blocking the particular angle of incoming focal sunlight that is being confronted. 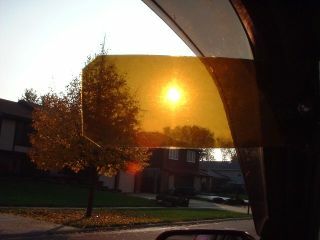 With changing light conditions from front to side, one finds himself or herself continuously readjusting the vehicle sun visor across one’s field of view. And even with the sophisticated vehicle visors now available, how many times have we all in frustration simply raised an arm so as to position a hand between the incoming sunlight angle and one’s eyes? There is an inexpensive solution to the problem of blocking the sun from one’s eyes. It’s called The Light Visor. The Light Visor is an auxiliary mini-sunshade which acts in effect like a “miniature hand” which is rotatable about the end of a thin, flexible "stay-put" arm. The opposite end of the flexible tube is non-obstructively fastened to a clip or bracket, which attaches to your vehicle sun visor. The Light Visor saves you from having to hold your arm in a tiring position when the sun is blinding you and your vehicle sun visor cannot effectively block the immediate sun angle. The Light Visor is quick and easy to use and to store flat against your vehicle sun visor. It does not in any way hinder or otherwise interfere with your normal use of your vehicle sun visor. Its unique method of flexible control over a miniature shade offers swift and accurate eye shade positioning without ever having to take your eyes off the road. The Light Visor utilizes a thin (.25 OD) flexible, 16” stay-put tube, or “flextube,” which is coupled at one end to a frictionally rotatable, 2”x5” opaque, fabric mini-shade, or a foldably flexible, tinted plastic, mini-shade. 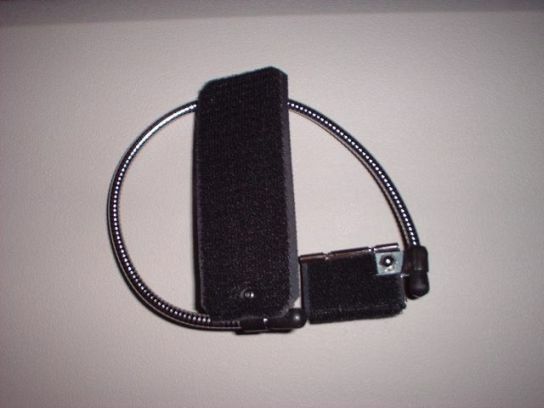 The flextube's opposite end is then coupled to either a secure mounting clip that attaches to the hinge rod end of your vehicle sun visor, or to a slidable, knob-tightened bracket. 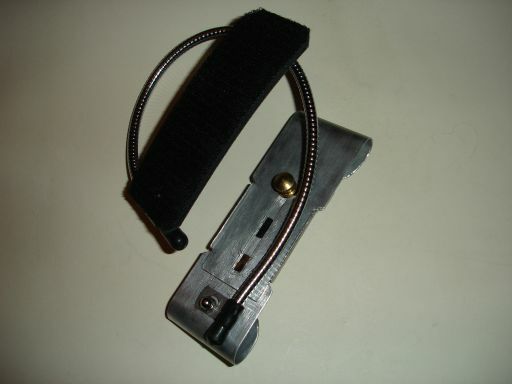 The clip or bracket, centrally located on your vehicle sun visor, provides a middle pivot point for the “steering” of the mini-shade at the opposite end of the flextube. When you wish to use your vehicle sun visor, the Light Visor simply curls and presses up against the underside of your vehicle sun visor completely out of the way. The Light Visor simply and safely provides an effective sun-blocking means for focal sunlight from any direction. Alternate versions of the Light Visor which have a lighting circuit incorporated into their structure may be used for various lighting purposes within the vehicle or for emergency use outside the vehicle. This web site is primarily intended for informational use by automotive aftermarket and other manufacturers, and media outlets. Nonetheless, all who enter here are welcome to consider the issues. 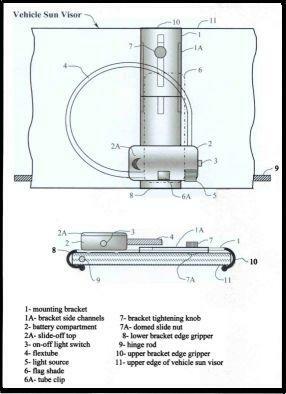 The photos and drawings on the various pages of this web site show examples of some of the possible embodiments of a patented invention called The Light Visor. The name Light Visor is intended to convey the possible dual purpose of the device, which is to be both a unique, miniature, auxiliary sun visor for focal sunlight, and a directable auxiliary lighting system within a vehicle. The Light Visor patent was offered for licensing when it first issued in 1996, but was eventually withdrawn from possible licensing when it became clear that the automotive aftermarket and other manufacturers then approached all had similar objections to the crude non-electric prototype that was presented to them. Whereas all of the various manufacturers agreed that the prototype device functioned as intended, their concerns were with the possible product liability issues that might arise if the Light Visor were marketed. The intent of this web site is to attempt to explain how the times have changed, and why products similar in function and partial design to the Light Visor are now being utilized throughout the world without apparent problems. The Light Visor patent 5,564,771 was issued on 10-15-1996 and would have expired on 11-15-2015 if it's maintenance fees had been paid. The last fee payment date is now past and the patent entered public domain status in October of 2008. Nonetheless, I believe there is still hope for the Light Visor to be manufactured by anyone who so desires. Hopefully, this web site will properly convey the overall change in marketplace attitudes toward the original issues and objections to the development of Light Visor-related product lines. For those manufacturers who may be further interested in the making of the various Light Visor products, the hyperlinks below will carry you either to downloadable PDF files containing detailed informational disclosures on the proposed Light Visor product lines, or to other related web pages.